Hola! Well it seems somebody opened some Pandora's box (in a good meaning) with his Wunschliste! haha. I knew from the Abwärts/Christiane F relation from the "Breaking news" comp Frank Z's booklet I mentioned in other comment (they lived together in a squat or something) but what I didn't know was about her musical career. Checking the wiki page you mentioned, saw they talk about this other project, Sentimentale Jugend; the name rang a bell so I checked my discography lists and yeah, they (Ch. F. & the MDK/EN guy) had a full side (with EN) in the 1980 "Monogam Sampler"; that should complete the list of recordings you've given, I guess. Fantastic! I did pick up the Borsig Maxi in Berlin 82 (i think). Never heard about or seen any other Super Max. Real Gem´s all so far. Vielen danke aus Schweden! Dit is cool und neu für mich... Bedankt ! Thanks so much for this. I use to own it on a homemade tape compilation but there were years of frequent moves and somewhere along the way it got lost. Brings a tear and a smile to hear it again and have all those feelings wash over me. I have hunted high and low for an MP3 rip of the Final Church 12 Inch EP and there is only one copy of this at Discogs going for 50 euros and I really want to hear it before I spend that kind of money! 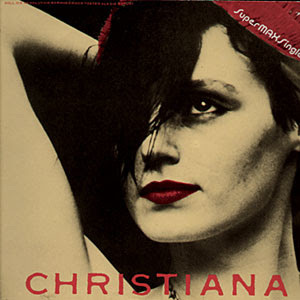 If there is any chance at all of you reuploading this (and/or any other Christiane F material) I would be eternally grateful....I have a 192 rip of the Decoder compilation if that helps though you have probably got it anyway....or if there is any particular kind of music you are looking for, let me know and maybe we could swap for the Final Church rip. Hello my fellow music lover! I am a young guys from Portugal with a thirst for knowledge. In my research I stumbled upon your blog and this amazing album. Would you be so kind to share it with me?